I’ve signed up to research a PhD at CRITE, the Centre for Research in IT in Education, in the School of Education at Trinity College, Dublin. My topic is TeachMeet, the research questions come under the broad heading of “what is the niche of TeachMeet?” . It’s a part-time adventure, so there is also a real life! The supervisory team is Dr Keith Johnston of the School of Education and TCD Visiting Fellow Dr Richard Millwood . Anything that need to be shared online will be on display, or be linked to, from here. Most items hanging here so far are what I call ‘procrastinactions’ – stuff being done when I really should be doing ‘proper’ writing. In full nihil de nobis, sine nobis mode, all items are presented with an invitation for the interested and the informed to send me an email at amondm@tcd.ie. Item 1: Context – my ‘TeachMeet in 3’ podcast and memo with a brief recording of my answer to the most often asked question about TeachMeet – ‘So, what happens at a TeachMeet?”. 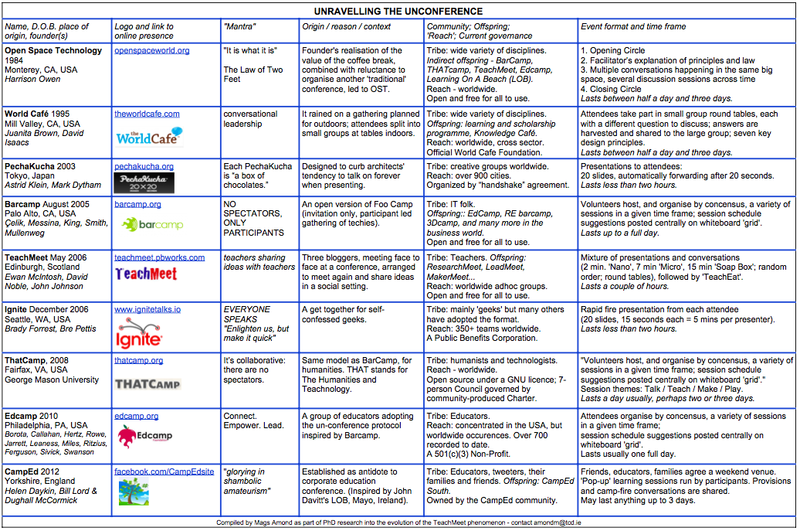 Item 2: Evolution of TeachMeet – the Timeline, very much a work in progress. This has been fun – it has a beginning, over twelve years of a middle, but the end is as yet undetermined. 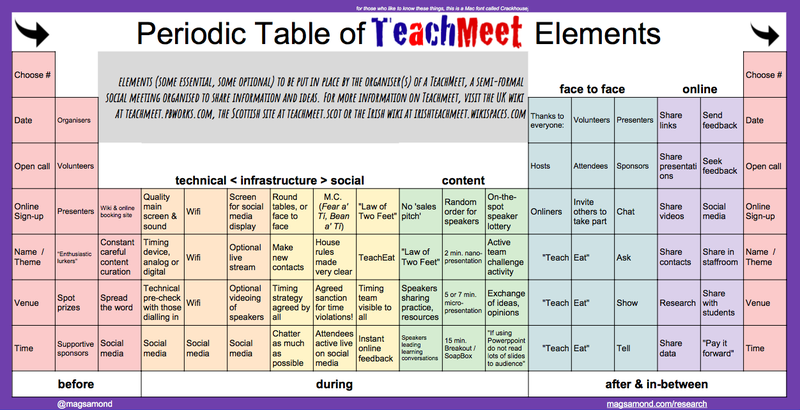 Item 3: PeriodicTableTeachMeetElementsA3 – This was constructed, peppered with a pinch of salt, during my deep dive into all things TeachMeet as 2016 merged into 2017. Item 4: Genesis – What I’m calling UnravellingTheUnconference – researching one unconference naturally leads to all sorts of distraction following the branches backwards to the roots at Open Space Technology (for now…there’s scope for ‘Infinity and Beyond’ in this quest). Item 5: What I now call Ewan McIntosh’s Four ‘Pillars’ of TeachMeet – love this. Item 6: 90 second video I made for some colleagues to use at a formal meeting in Ireland. Item 8: Dictionary Quest – a reminder of a call sent out on Twitter to try to get TeachMeet into the dictionary – it’s a bit mad doing a PhD on something that hasn’t yet been defined. Feel free to pop along and retweet either, or both. Every little helps. (Update – I have since found one definition offered in an online Dictionary of Education, yay; but I’d feel happier if it was in *the* Oxford English Dictionary , especially the online version @oed). 10+ yr should quality for inclusion. What do you think, #teachmeet tribe? And so here was my #tmBETT17 nano – TeachMeet, the noun, is not in the dictionary. Item 9: A thought about TeachMeet as ‘desire line’. Item 10: https://magsamondposts.files.wordpress.com/2017/04/teachmeetorigins.wav – an 18 minute narration of the origins of TeachMeet as discovered in a variety of blog posts, online media reports, newspaper articles. As it is a .wav file, perhaps make a cuppa while it is loading. Item 11: John Johnston, one of the three founders of TeachMeet, hosts a weekly chat about education, called Radio Edutalk. He and I spoke in November 2017, tune in here. Item 12: Date pertaining to TeachMeets advertised in the UK and Ireland between January and June 2016 is mapped in a Google Fusion Table here TeachMeetsSharedData. Item 13: A paper, outlining what I’ve found out to date, was written with Keith and Richard and presented by me at INTED 2018 in Valencia. This in itself was an experience for me – the writing of the paper was tough but the interest of those (academics from all over the world) who attended the presentation and discussion was hugely rewarding. The paper, Self-Organised CPD, the TeachMeet Phenomenon, is published in the conference proceedings; but as that is behind a very high wall, ping me at amondm@tcs.ie for a pdf copy. TeachMeetResearch by magsamond is licensed under a Creative Commons Attribution 4.0 International License. Based on work at magsamond.com. Permissions beyond the scope of this license may be available at magsamond.com.